Manneken Pis is the pride of Brussels. When walking down Rue Charles Buls/Karel Bulsstraa in Brussels, you’ll come to a pass located between Rue de l’Étuve/Stoofstraat and Rue du Chêne/Eikstraat. You’ll find several people crowded around this bend, photographing a small statue of a naked boy urinating into a fountain’s basin. 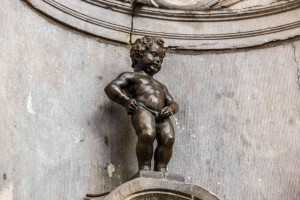 This statue is the famous Manneken Pis, meaning, “little man pee”, and he’s been delighting the people of Brussels since 1618. The 61 cm tall bronze statue was made in 1618 by Brussels sculptor, Hieronimus Duquesnoy the Elder. There are several legends regarding the small statue. One of the more famous legends involves Duke Godfrey III of Leuven, who at the time only 2 years old. In 1142, his troops were battling the lords of Grimbergen and put the infant lord in a basket hung from a tree to encourage them. From the tree, the lord urinated on the troops of Berthouts, who eventually lost the battle. Another legend tells the tale of a wealthy merchant who during a visit to the city lost his young son in the crowd of people. The merchant formed a search party and looked throughout the city and countryside for his boy. The locals searched high and low and later found the young boy happily urinating into a small garden. The merchant had the statue built as a way to thank members of the city. Manneken Pis enjoys changing his clothes. Traditionally, the sculpture has a different wardrobe at least once a week. More than 800 costumes have been worn by Manneken Pis, all of which you can see at the Museum of the City Brussels. A non-profit called The Friends of Manneken Pis manages and selects costumes from among hundreds of designs submitted each year. Tourists gather from far and wide to see what interesting costume the little boy will be wearing next. The country is well known for its eclectic beer selection and rich chocolate treats. While visiting Belgium, ask to sample a draft of Blanche De Bruxelles, the Manneken Pis Belgian White. Experience the taste of a classic brew while examining the hoppy homage to the bronze sculpture. Looking for a chuckle-worthy souvenir? Visit one of the gourmet chocolate shops in City Center for a solid milk chocolate Manneken Pis delight. Experience an exhilarating Belgium adventure on the Euro Focus, and Great Escape tours. It’s never too late to get a taste of a multitude of exciting cultures! This entry was posted on Wednesday, September 28th, 2016	at 9:47 am	. You can follow any responses to this entry through the RSS 2.0	feed. Both comments and pings are currently closed.